Valentine's Day is almost here and I thought it would be a nice gift to my readers to offer a free download for a Valentine's Day card of my original art. You can also download the hand-lettered sentiment to add to the inside of your card. Decorate it with rhinestones, bows, and other baubles to personalize it even further. 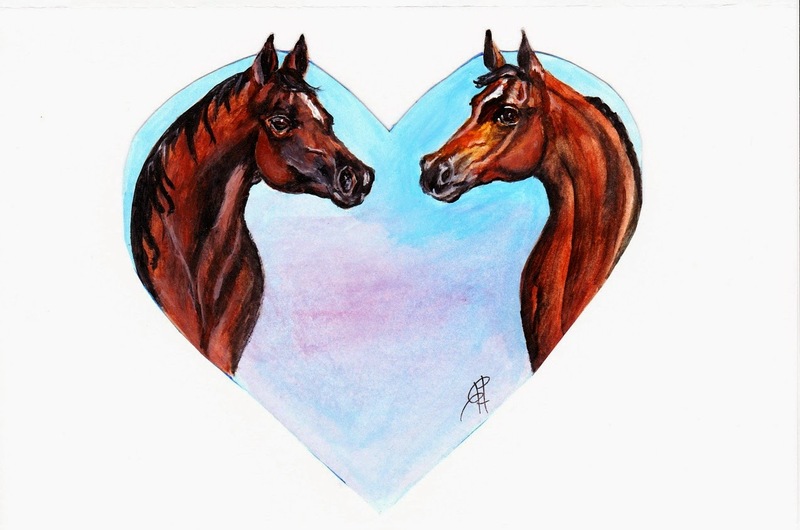 And don't just use it for Valentine's Day they make great note cards to send to all your horse loving friends! Print your card on card stock paper sized 8 1/2" x 11" in your home printer. Fold in half. You can either purchase 6" x 9" envelopes at your local party store or make your own. If you download the hand lettering, print it on tracing paper in your printer and attach to the center with a glue stick. Card stock paper cut to 8 1/2" x 11"